I love a good steak or pork chop (or chicken or ribs for that matter) cooked over natural wood charcoal as much as the next guy. Let’s face it, the reason we light up our grills is to cook meat. It is the ultimate pleasure that hot charcoal can provide. However, with some creativity and little effort one can make a very tasty vegetarian meal on the grill. This Sunday, in addition to putting a few chicken legs on the grill for the kids, I prepared a few dishes for Diana and I with no meat. 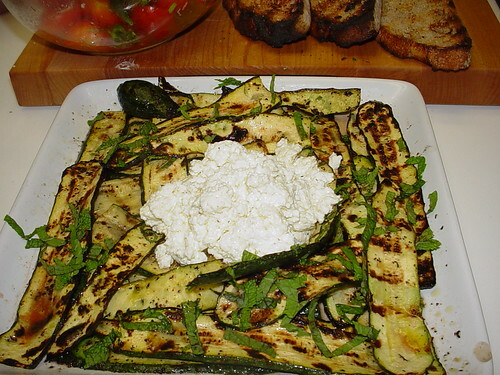 From Mario Batali’s “Italian Grill” I made the marinated zucchini with homemade ricotta. The vegetable is sliced thin on a mandolin and marinated it with some herbs, oil and vinegar. After grilling, some more marinade is poured on top, in addition to chopped mint leaves. 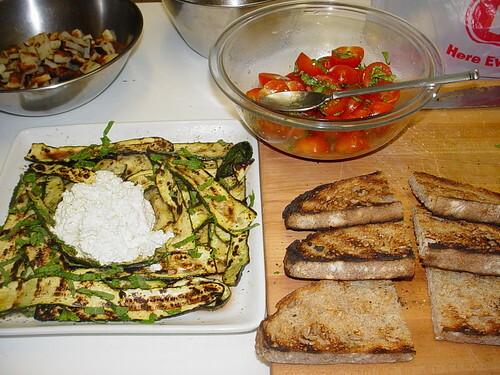 It is served with ricotta mixed with olive oil and with slices of grilled rustic bread. This a delicious mix of flavors and textures. 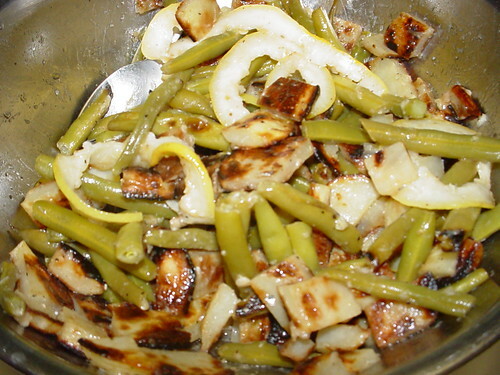 Another dish was something improvised, a sort of potato and green bean salad. 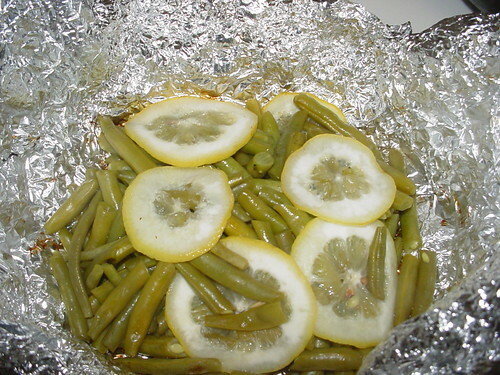 I ‘steamed’ the green beans in aluminum foil with lemon slices and a bit of white wine. The packet was placed right on the grill. I grilled the potatoes directly on the grill and I also wrapped a few garlic cloves in foil and put them straight on the coals to roast. I made a dressing using those garlic cloves after mashing them. I mixed them with olive oil and lemon juice. I sliced the potatoes and tossed everything together. Not bad at all. Last but not least was a cherry tomato and basil salad. Nothing more than tasty tomatoes, olive oil, torn basil, salt and pepper.